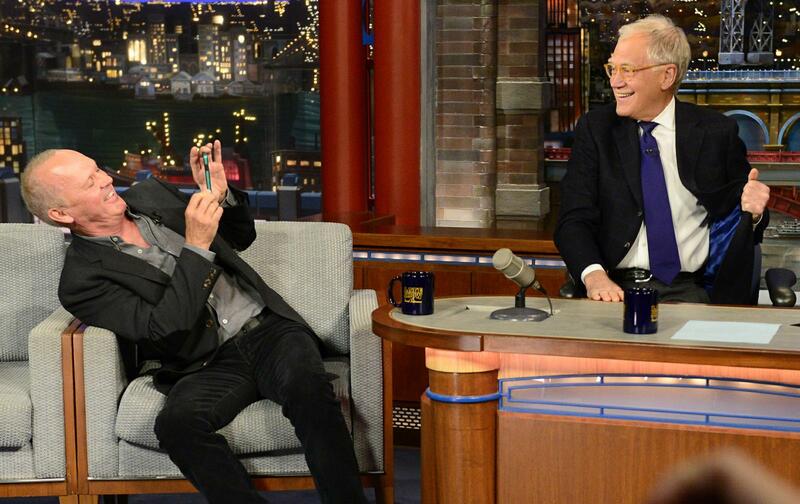 Photo John Paul Filo/CBS via Associated Press: Actor Michael Keaton, left, uses a cell phone to take a photo of host David Letterman, Tuesday, April 28, 2015, on the set of the “Late Show with David Letterman,” in New York. David Letterman (68 years old) sat down for an interview with the New York Times. The host of Late Night will have his final show on May 20, after 33 years of entertainment. Mr. Letterman was not only one of the most innovative broadcasters, he was charming and unpredictable host as well. Letterman’s replacement will be Stephen Colbert and Letterman said that he didn’t made that decision, but he surly believes that Colbert will do a good job. Letterman also said how things were different when he was starting and he also talked about restrictions and boundaries that he needed to cross at the beginning of his career. He also talked about other late night shows and their hosts: Jimmy Fallon and Jimmy Kimmel: ”When I was watching those interim shows they did The Late Late Show, and I saw John Mayer hosting one night, I thought, “Ohhh, now I see exactly what the problem is.” Because he’s young. He’s handsome. He’s trim. He’s witty. He was comfortable. So then I realized, I got nothing to worry about. I know I can’t do what Jimmy Fallon is doing. I know I can’t do what Jimmy Kimmel is doing. There’s nothing left to be worried about.” Letterman also added that he doesn’t feel like he was pushed out by Jimmy Fallon and Jimmy Kimmel. He said that Jay was his competitor, but when Jay left he was suddenly surrounded by younger guys or in his words – “by the Jimmys”.